Ready to fly... - Feb 2018: Where is Darcie? I'm alive & well & taking some time to write/right what's in my head. Available to give Skype lessons and open to new possibilities. I'm in Austin, TX although that could change at any moment. :-) Messaging me on Facebook is probably the best way to contact me right now. Go to the lessons page to see a menu of the instruments I teach, along with my approach, styles, & levels. "Pilots and musicians are of the same breed. They all have their heads in the clouds," Darcie muses. Born in Toronto to a journalist/pilot mother and a bush helicopter pilot father, she started her childhood in Northern Canada, constantly moving around the North American continent, from one culture to another. At 16, Darcie struck out on her own, continuing to "pay her dues", making her living on the streets of Toronto playing guitar. Finally finding home in Austin, TX, Darcie is well known for her fiery fiddling and singing her songs, and with artists including Ray Wylie Hubbard, Eliza Gilkyson, Toni Price, Slaid Cleaves, Tish Hinojosa, The Meat Purveyors, and more. Currently she's a member of the band The Austin Lounge Lizards. Darcie’s versatility is her strength. In the past few years she has developed her own personal way of coaching music for adults and kids of all ages. Her involvement in theatre keeps her busy in Canada, Austria, Italy, Prague, Scotland, NYC, and other US cities. 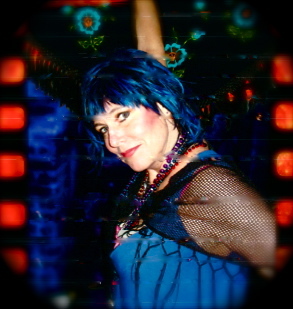 Currently Darcie is a cast member of the play "Woody Sez", a four person cast that is also the band. Her part was written for her, playing multiple characters and instruments. In 2007 she released her 5th CD, "Livin' on the Lucky Side.” Her alter ego/evil twin fiddle sister, Marcie Mercy, assists. Darcie and Marcie also team up to perform, write stories, play on and produce CD's for other musicians. "Intelligent, warmly satisfying and touching. At home on an assortment of instruments, Darcie Deaville is not to be overlooked ..."
The Austin Lounge Lizards - Just released the new CD "Home and Deranged"
The Austin Lounge Lizards have been performing satirical folk music in Austin and around the US and Canada for 29 years. The band has become the darlings of activist groups, who have relied on their songwriting talents to parody subjects such as abuses of the pharmaceutical industry, media conglomerates, health care and more. Their recording of Irving Berlin's "C-U-B-A" was featured in Michael Moore's most recent movie, "Sicko." "The Drugs I Need" is the Lizards most topical album yet. Based in Austin, Texas, since they formed in 1980, the Lizards have honed their music into a knife-sharp art form. They've delighted audiences from Texas to California, from Canada to the U.K., with their inventive style of satirical folk, country and bluegrass. Trademarks of a Lizards song are highly literate, sharply pointed lyrics that poke fun at politics, love, religion and the culture in general. For example, among the songs on their latest CD, "The Drugs I Need", are the title song and four others commissioned by Consumers Union and other advocacy groups. The Lizards tackle the pharmaceutical industry, health insurance, big media and big oil, and excessive credit card debt (a touching duet entitled "Xmas Time for Visa" with guest vocalist Tish Hinojosa), and the newest is an animated video called the Balance Transfer Switcheroo, featuring Darcie on the lead vocal. New Orleans keeps Marcie's soul thriving. The Northernmost city of the Caribbean, the melting pot of many cultures, is the heartbeat of Marcie's playing. The Meat Purveyors (a now defunct band from Austin TX, said this about Darcie - "[She] provides the fiery fiddling and the wild-eyed stares that fans fear to love and love to fear". Marcie was doing the playing in that band. Marcie is incognito while Darcie is in Israel. She hid in Darcie's suitcase and is still making appearances, unable to stop herself.